The game featuring two future NBA draft first round picks lived up to the hype. The two 6-foot-10 forwards guarded each other for the majority of the time Ellenson was on the floor. Ellenson exposed Simmons’ weak interior defense, and Simmons took advantage of Ellenson’s shaky high-post defense. The offensive stars went neck-and-neck. 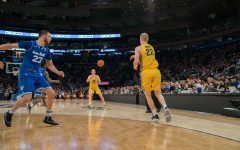 Ellenson sat out for a majority of the first half after picking up two fouls, but he came out firing for Marquette in the second half, scoring seven of the team’s first nine points. Ellenson finished with 16 points on 6-of-11 from the floor, with 11 rebounds and a perfect 2-for-2 from three. It was his second double-double of the season. He also committed five turnovers. 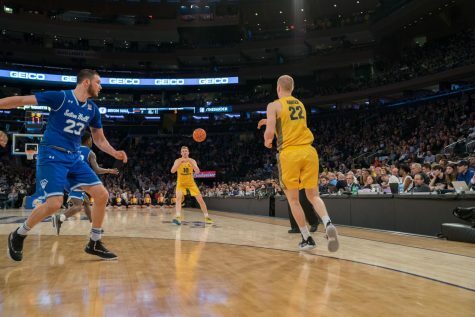 When Ellenson was out of the game, redshirt junior Luke Fischer guarded the quicker, more athletic Simmons. Still, Fischer used his strength to take advantage of the freshman and finished with 19 points and eight rebounds. Simmons, while he never seemed to dominate the game, showed why he will likely be the No. 1 pick in June’s NBA draft. 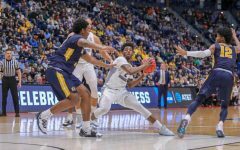 He notched 21 points and 20 rebounds – half of LSU’s total rebounds – and added seven assists, but he shot just 6-for-14 (43 percent) from the floor. 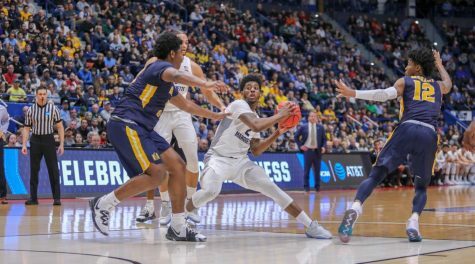 His court vision was unbelievable for a 19-year-old, slipping passes through tight crevices in the Marquette defense. 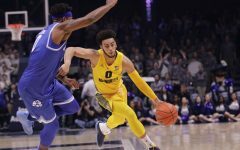 Still, Simmons didn’t own the game as much as he could have: with LSU down one in the wading seconds, Simmons drove at Fischer, who had four fouls, but decided to pass the ball to a teammate, who missed the game-winning shot. 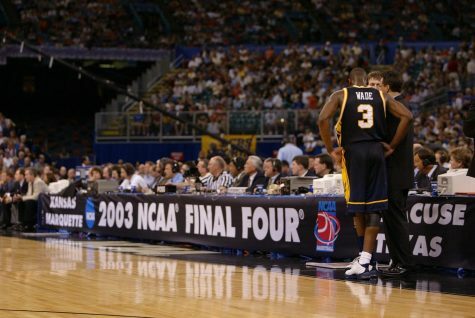 Marquette entered the game ranked No. 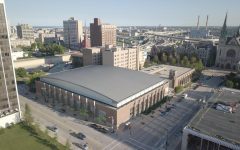 340 out of 349 in Division I in three-point percentage, shooting 21.9 percent through three games. However, the team shot 45 percent in the second half against Iowa Thursday, and carried that momentum into the LSU game. 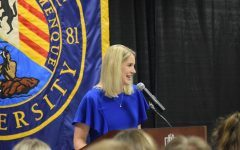 The Golden Eagles shot an efficient 7-for-19 from three (36.8 percent). 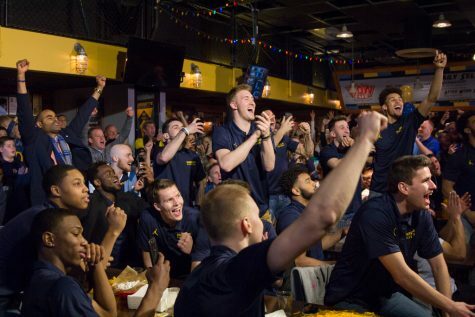 Henry Ellenson went 2-for-2 and Jajuan Johnson went 2-for-4. Duane Wilson went 3-for-9, though some of those came in clutch situations. He did, however, jack up a three with about 40 seconds to play with Marquette up by one point instead of draining the clock. The redshirt sophomore is now 7-for-31 (22.5 percent) on the season from long range. 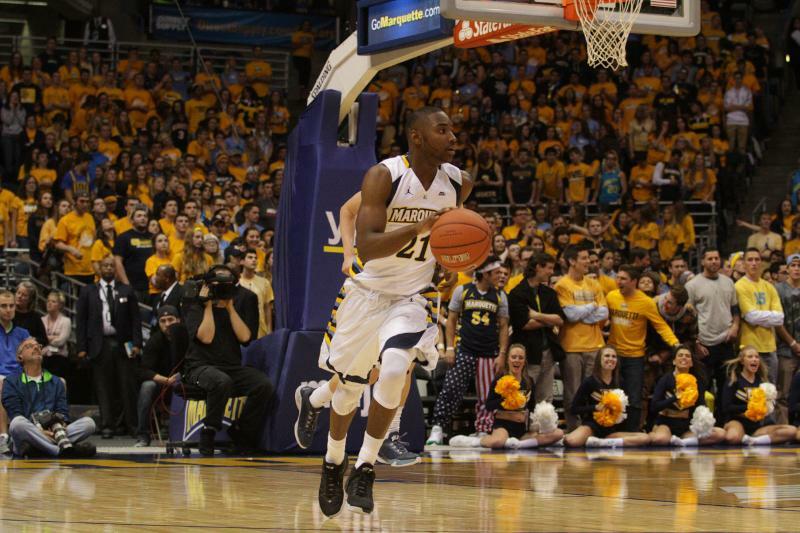 Marquette is now shooting 25 percent (23-for-92) on the season. 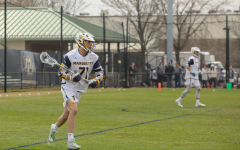 Traci Carter had a bumpy start to his Marquette career, but he showed signs of improvement in his first collegiate start against LSU. 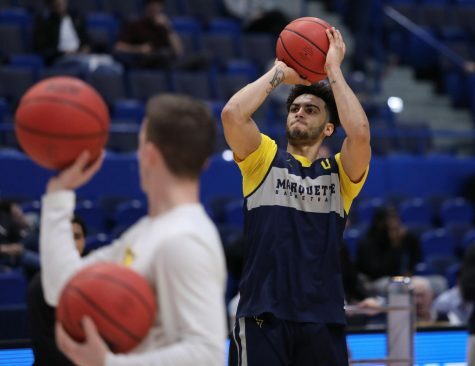 He only went 1-for-5 from the field, but he pulled down five tough rebounds and dished out five assists, including a pretty interior pass to Luke Fischer for an and-one to put Marquette up 62-53 halfway through the second. He still had three turnovers against an aggressive LSU press and he was occasionally reckless on drives to the hoop, but he handled the ball a lot better than he has at any point this season. 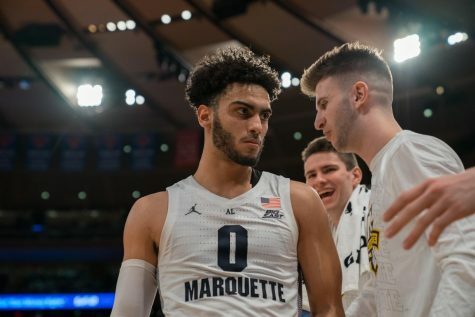 The Carter that played against LSU more resembled the player that impressed Marquette fans in the Golden Eagles’ overseas trip: confident, aggressive and always looking to facilitate. 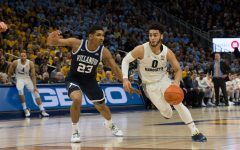 If he can play the role of table-setter more consistently, then Marquette may have found their answer at point guard. 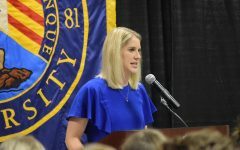 Securing the basketball is one of the biggest issues that young teams often have, and the Golden Eagles have been no exception so far. They gave away the ball 22 times against the Tigers, which brings their turnovers per game average to 18 for the season. Henry Ellenson and Haanif Cheatham were tied for the team lead in turnovers with 10 coming into this game, and neither player was much better tonight. 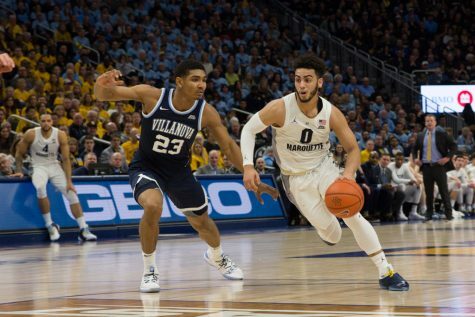 Cheatham turned the ball over five times while Ellenson recorded four turnovers. 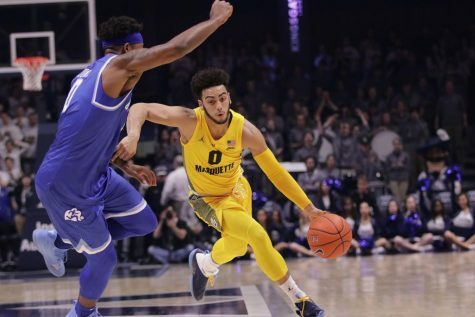 Three turnovers in the final two minutes nearly cost Marquette a game that they had largely controlled. Henry Ellenson got called for a charge, Traci Carter fumbled the ball away while foolishly trying to split two defenders and Haanif Cheatham threw a pass directly to Ben Simmons, all within 100 seconds of each other. 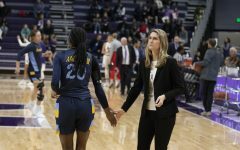 Mistakes didn’t end up costing the Golden Eagles a winnable game tonight, but you can bet they will at some point unless they start being more careful with the ball.